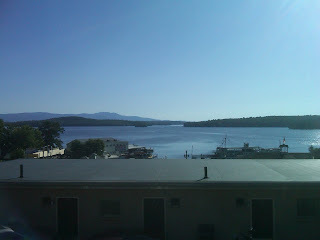 This past weekend I made a trip up to Lake Winnipesaukee with Bethany and a few others. It was my first trip of the summer and I was worried about the two-hour car ride, but I did just fine. My dad has an ice cream and candy store on Weirs Beach on a pier that my grandparents own, so it’s a fun time. Doesn’t feel like summer without a visit to Weirs Beach. It was nice being able to spend some time with my dad and sister. The weather was a huge plus too; I even got to use the pool – what a gorgeous weekend it was! Check out the view from the balcony of the place we stayed. Such a beautiful lake. These days the nausea has been mild, but consistent. I’m trying not to let it run my life though. Being proactive with medication. I’m finding that a lot of the nausea is mental, so that can be tough to deal with. But dealing, I am. It certainly has been nice having a break. I am both dreading and eager for Thursday. It’s my final 5-day treatment, sure to be abound with that “eck” feeling. It’s the start of my final cycle though, which is very exciting. Mentally, I am preparing myself for this final 3-week battle. I don’t want to build it up too much, but I do want to be prepared. So let the battle horn ring loud because cancer is a’going down. Thought of you often today, hoping that this final round is a little less harsh than 1 and 2 … and feeling relieved that it's the home stretch for you. As you probably do, I wish it was already next Tuesday. But it's not … so go kick the crap out of FOC. I loved seeing you!! I'm so glad you were feeling ok to come up! =)I love the picture you took as well, so beautiful. I know you can and will make it through these upcoming weeks. I feel so bad about all the side effects of the damn chemo but I know that it is killing the cancer which is the most important thing. Although, you obviously don't deserve to undergo all these terrible side effects but they will end soon my dear, just wait!!! =) I love that line, "cancer is a'going down", hell yeah bro!